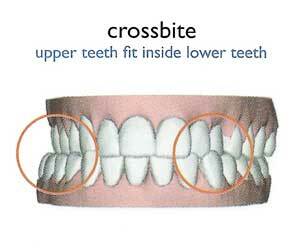 Palatal expanders are used to correct a crossbite. Sometimes they are referred to as rapid palatal expanders. They widen the upper teeth and jaw by gently separating the bones over the upper jaw horizontally, so that your top and bottom teeth fit together. Palatal expansion can happen over a few weeks to a month, and afterwards the appliance remains in place to retain to ensure the teeth and bones are stable in their new position. Overall, expanders usually have to stay in for up to six months, but times will vary with each patient. 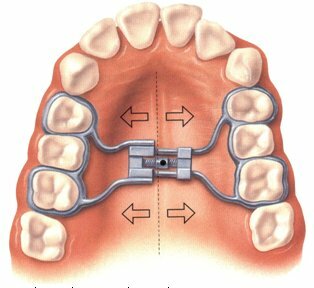 As the expander begins to work, you may start to form a gap between their two front teeth. This is perfectly normal. In fact, it is a great way to know that that expansion is working. Usually, once the expansion has been completed, the two front teeth drift back toward each other. Palatal expanders consist of rings glued around the back teeth, wires, and a small expansion screw. A small tool is used to turn an expansion screw in the center of the expander. With practice, parents find this easy to do at home once or twice per day. The palatal expander works by placing gentle pressure to expand your palate. This may cause discomfort after each adjustment. Palatal expanders take some getting used to. Pronouncing certain words may be more difficult and you may notice increased salivation. Both of these will go away after a couple of days, as the mouth becomes used to the expander. Brushing around the expander is important to prevent any irritation to the gums. After this phase of treatment is completed, our Orthodontist will remove the expander and wait for all of the adult teeth to erupt. At that point, they will begin the second phase of orthodontic treatment. This may include braces or Invisalign.